The Wool Scouts Retreat, held deep in the Maine North Woods is about landing. It’s about connecting with place, leaning-in to our craft and finding the deep connection one can have with landscape. Join Mary Jane Mucklestone to explore the traditional mittens of the area, learn how to start flint & steel fires, paddle, and try your hand at fly fishing. Come land for a while in the wilderness, dig your hands in, eat amazing food, talk with friends and lean-in. We’ll be gathering at Bradford Camps, a classic Maine camp, the only structures on Munsungan Lake, surrounded by 3.5 million acres of forest. Price: $1520.00 This includes all meals, lodging, classes, workshops, materials, tax & gratuity. Transportation not included. See access for more information on float plane fly-in opportunities. CANCELLATION POLICY : 50% deposit to secure registration. Final payments are due by June 13th. Cancellations made prior to June 13th, are refundable less a $250 cancellation fee. Cancellations within 60 days of event are non-refundable. There are no exceptions. Fiber Trek & Bradford Camps reserve the right to cancel or reschedule this retreat as a result of unforeseen circumstances. In the event of a cancellation by Fiber Trek or Bradford Camps all fees will be refunded in full. To register-email fibertrek@gmail.com. A form will be sent back to download, complete and highlight instructions for payment. All inquiries will be treated on a first come, first serve basis. Should the retreat fill, you will be given the option to keep your name on a waiting list. Instructor: Mary Jane Mucklestone: Each participant will receive one, four hour class with Mary Jane focused on Fair Isle knitting themes. Workshop Topics: More topics will be added per time and interest. Sarah Hunt is the host of the Fiber Trek Podcast and has a strong penchant for grey yarns, the toothier the better! She is a Registered Maine Guide and enjoys adventuring in wild places, even her backyard with wool in hand . Jani Estell is the wool manager of a wild flock of sheep off the Maine Coast. She is also the miller and owner of Star Croft Fibers which creates magical, Maine yarn from those same sheep. 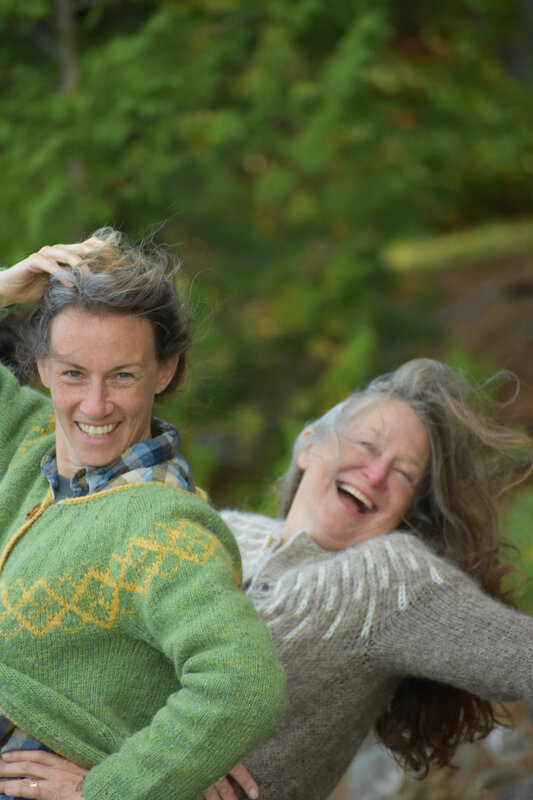 An accomplished knitter and spinner, Jani is interested in traditional knitting and those cultural fiber stories associated with time and place. Bio: Coming soon! To learn more about Nicole you can visit her podcast The Gentle Knitter on YouTube. Igor Sikorsky is co-owner of Bradford Camps. He grew up in the Simsbury, Connecticut area and spent summers at Cobb's Pierce Pond Camps in western Maine. There began his love of the northern Maine woods. After college he took to the road for a few years in the construction industry, working for Wood Structures in Saco, Maine. During their early years with his wife Karen, they hiked Katahdin, explored the Allagash region, and traveled throughout the woods of Maine exploring and enjoying its wonders. Accommodation is shared. Members will be assigned a cabin and parties can be placed together. Time at Bradford will be highlighted by Maine waterfront log cabins, handsome and solid as can be imagined. They are hand hewn log cottages, with lakefront porches, sunset views, and include hot and cold running water as well as a full private bath. Each waterfront cottage is cleaned daily by our staff and the wood stoves are kept warm during colder days. The waterfront log cabin rentals are lit with elegant propane lights; no electricity in the cabins. Our lodge and modern kitchen have electricity, so cameras can be recharged. Lakefront lodging cottages include linen service, towels, and ice from our ice house! 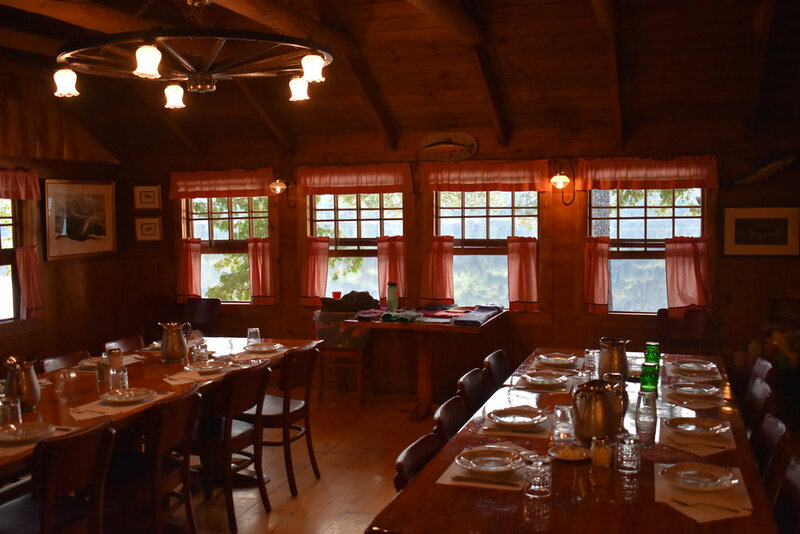 The Maine fishing lodge serves delicious breakfasts, hot lunches and dinners. We freshly prepare turkey dinners, prime rib, pork loin, fresh fish, fresh vegetables from our garden, home baked breads, pies and cakes for dessert, and an open menu breakfast. You won't leave the table hungry! (and if you do, there's always the cookie jar!) During August our garden provides a good portion of our vegetables. Special dietary needs can usually be accommodated. Access & Transportation: Participants are responsible for making their own travel arrangements. Travel by road to the camps includes a vast stretch on working, logging roads. The camp can be accessed by car but it is recommended the vehicle be equipped to manage flat tires, and rough terrain. Note that drivers will be sharing the road with large, 18 wheel logging trucks. Fly-in is highly recommended. Car Rental-Bangor & Portland-Note that cars cannot be rented in Canada and cross the border. CANCELLATION POLICY : 50% deposit to secure registration. Final payments are due by June 13th. Cancellations made prior to July 13, are refundable less a $250 cancellation fee. Cancellations within 60 days of event are non-refundable. There are no exceptions. Fiber Trek & Bradford Camps reserve the right to cancel or reschedule this workshop as a result of unforeseen circumstances. In the event of a cancellation by Fiber Trek or Bradford Camps all fees will be refunded in full. We hope to enrich the fiber world with stories, hope and beauty. Join us as we tour the best the world fiber community has to offer from the Falklands to Norway. Fiber Trek takes you out of the rocking chair and on to the trail with exciting travel, foods, farms and fiber!